Oh, you didn't know Podcaster was still available, did you? Well, not officially since Apple killed off any sanctioned avenue for Podcaster's developer to get it on the iPhone. Fortunately, iPhone owners' got a lot of smart developers who brought us tools for jailbreaking and unlocking. And that's how I found Podcaster. I clicked on Cydia on my iPhone and "wow, podcaster!" Here's the thing. You don't have to do that. In some instances, you can access the podcast directly from the podcast website. So along came Podcaster and it made much easier to access your podcast. Podcaster was seen as an attempt to cut the umbilical cord between iTunes and Apple's mobile devices. Apple will not allow it to be substituted or cut. 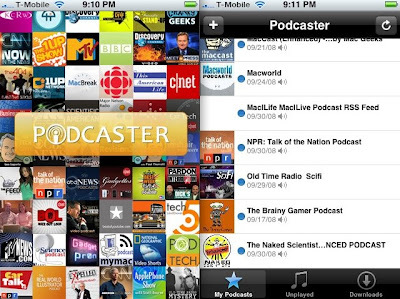 Now, Podcaster works just like another other authorized or unauthorized app. Before paying for it, there is a two-week trial period. You can add podcasts. It'll take you to a search page where you can see if your favorite podcast is part of its directory. I did a few searches and did not find only a couple of podcasts I subscribed to on iTunes. 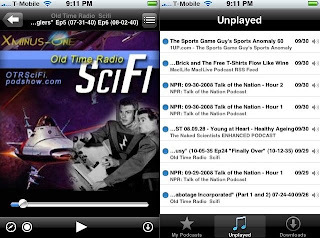 Once you find your podcast, click on it and Podcast will start to import a listing for the podcast. Then simply click on your podcast and you'll find yourself looking an available list of episodes. Tap what you want to listen to and you're set. It's easy. If you had told me this was an app created by Apple, I would have believed it. Give it a try if you've got a jail-broken iPhone. Support Podcaster if you find it very useful. Apple will be hard-pressed to create something just as simple and enjoyable to use. Note: Short history on Podcaster. It was rejected by Apple because it duplicated a function that they may have now or may have in the future. Finally after some cat-and-mouse games, Podcaster showed up on Cydia. Another Note: Apple lifted the NDA on the developers today. It is working to create a new agreement. I also hope they create a guideline for developers on what constitutes an acceptable app.